10 Best Design is pleased to launch the Best Web Design Firm award. This award is designed to bring recognition to web design and development companies that provide clients with exemplary services. 10 Best Design is pleased to launch a "Best Web Design Firm" category for its new monthly award. The February award acknowledges design companies that have excelled in providing their clients with top notch online representation and results. It’s no surprise to see Big Drop Inc, one of nation’s premier website design businesses, appear on 10 Best Design's February list of top web design companies. The professionals of Big Drop Inc excel in the work they do by adopting a client-centered approach, which involves maintaining full awareness of the business owner's goals and objectives. As creativity mavens, the company's representatives are skilled in appropriating several graphic design strategies to ensure that the client's website is optimized for visual appeal. The Big Drop Inc professionals also optimize sites for key elements like cross compatibility, connectivity, and functionality. Finally, the techies of the company maintain a cutting-edge, open-minded approach to the web design and development work they do to ensure that the client's online image is relevant to his or her target audience. Top website design business Blue Fountain Media also landed on 10 Best Design’s list for February. Blue Fountain Media's representatives work with unprecedented persistence, passion, and patience to ensure that each element of the client's website is perfected. As a team of marketing gurus, graphic arts designers, web developers, and business consultants, the techies of the company are highly skilled in ensuring that the business owner's site is an aesthetic masterpiece. Additionally, the firm’s in-house designers and developers will carefully review their work to ensure that there are no glitches once the site is publicized on the Internet. Finally, the Blue Fountain Media representatives keep each client updated and informed regarding every component of the design and development process to ensure 100% approval. 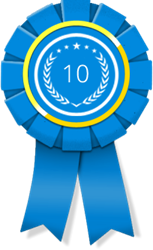 Maxburst earned its position in this month's 10 Best Design list because of its commitment to offering cutting edge, customized web design and development services. As a leading web design firm, Maxburst and its professionals are skilled in cultivating innovative, trendy sites that speak to the needs and interests of the contemporary market. Additionally, the Maxburst representatives are passionate about using the best responsive web design techniques available to ensure that the client's site is accessible across all platforms. The Maxburst team also specializes in creating corporate websites for business owners located in the heart of the New York City.